READER’S QUESTION: What do you do na di mo nagagamit yong nasave mo ? First and foremost maraming maraming salamat for we share the value of tithing and I believe so we honor One God and Creator who have made all things possible. Thank you too for seeing such a positive remarks towards my age. I guess the thing is I earned money very young so I learned to value it at a young age too. I have always been a believer that age is our greatest advantage and that we are never too young or too old to achieve our goals and aspirations in life. I must say congratulations too for the increase in your salary. If you have time please check out these two posts that can help you BIG TIME in dealing with you salary increase. I am also thrilled to know that you decided to get that said Insurance and commit to it! Apir tayo para diyan! 1. Write on a piece of paper your life goals for the next 10 years. Ilista mo lahat nang nais mong ma-achieve sa buhay. This is highly important because life goals can be our motivation in life. I suggest ilagay mo yung list sa place na lagi mong pinupuntahan so you’ll always be reminded on your aspirations in life. 2. Assess your current financial situation. It all starts with a day (isang araw hahh) that you dedicate just to examine how well you are financially. I wanted to discuss about this on a separate blog post but i-discuss ko na din briefly in this answer. a. Know your financial net worth. I hope the template that I sent to you helped. I also posted a blog post in regards to the importance of knowing your financial networth. You can click HERE. d. Choose the best bank account. Sometimes it’s all about having the right bank to touch your hard-earned money. Same din yan about choosing a credit card. e. Review your SSS, PAGIBIG and other deducted contributions. You should know how much you already have and the benefits as well as your deficiencies. 3. Once your done assessing your current financial situation then you have to make A LOT of changes. Sa lifestyle mo, sa personal life mo at sa lahat-lahat. There will be habits that need to be broken and habits din to be learned. Fighting to save in the world where everything has a price tag is so hard. Kahit ako I still struggle big time. I commit these things that ruin my finances and I became much of a one-day millionaire. 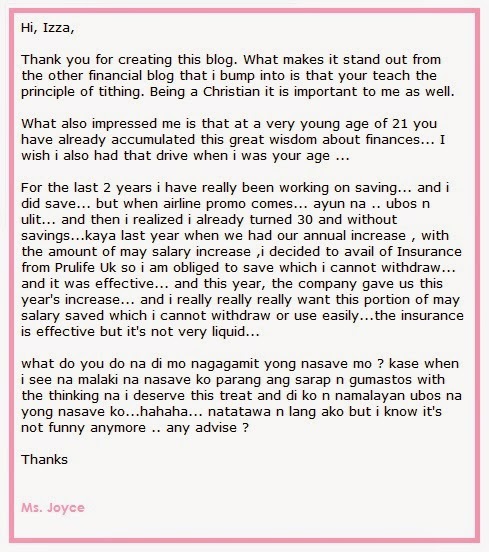 Pero alam mo Ms. Joyce the number one secret to save?! BECOME MORE AWARE. Habang nalalaman mo yung nagyayari, na nauubos yung pera mo sa wala, na tumatanda kang walang ipon and that slowly you feel like you are losing time, money and effort over nothing, I AM 100% SURE YOU WILL LEARN TO HUSTLE YOUR WAY TO SUCCESS. The good thing is you are not alone and you will never be alone. Marami tayong patuloy na lumalaban (hehe). Fight lang ng Fight Ms. Joyce. Remember to SAVE NOW! INVEST NOW! ACT NOW! Para hindi sa huli ang pagsisisi.